The PurLucid Treatment Solutions laboratory in Calgary, Alberta, MGX’s partner. Source: MGX Minerals Inc.
Oil companies could soon be powering the electric car industry. It’s a scenario that looks possible now that Calgary company MGX Minerals Inc. [XMG-CSE; MGXMF-OTCQB; 1MG-FSE] has found a way to extract lithium from waste water produced by Alberta oil sands operations. 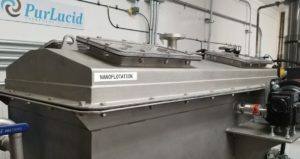 This week, MGX said its NFLI-5 commercial scale rapid lithium extraction system is ready for deployment following a successful demonstration in the Calgary laboratories of MGX’s partner PurLucid Treatment Solutions Inc.
MGX shares were unchanged at $1.16 following the announcement on Thursday, June 14, 2018. The stock is trading in a 52-week range of $1.96 and 75 cents. Until now, the problem has been extracting that lithium so that it can be used in the production of lithium-ion batteries that are needed to power some essentials of modern life, including electric vehicles, laptops, smart phones and just about every type of portable device. “You need a way of moving vast quantities of water through the system and then grabbing the lithium, and nothing else,” explained Purlucid Chief Executive Officer Preston McEachern. Combined, MGX says this Cleantech process does not require the construction of large, multi-phase, lake sized, lined evaporation ponds, greatly reducing the physical footprint and enhancing the quality of extraction and recovery across a complex range of brines that were previously considered un-processable due to complexity or geographical location outside of solar evaporation appropriate zones. MGX says extracting lithium from oil sands waste water is a more efficient alternative to hard rock mining of lithium ore, which can be very costly and involves a permitting process that can take years to complete. 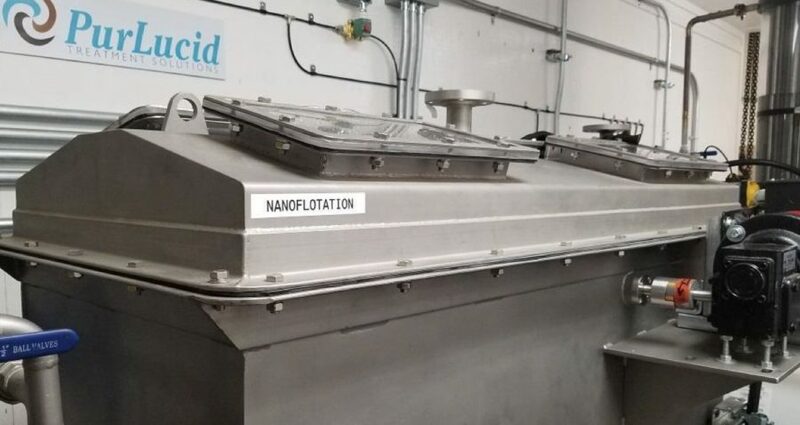 The company points out on its website that solar evaporation techniques require a processing period of up to 24 months, and can leave a massive environmental footprint. The partners believe that as this extraction process moves forward it will move big oil into big batteries. “Who better to design the renewables [for our] energy future than the guys who have been managing energy for the last 100 years,” said Lazerson. MGX notes that nearly 20 million barrels of oil and gas are produced daily throughout North America. It goes on to say that for every unit of oil and gas produced, 4-5 units of brine are pumped. As a result, the North American oil and gas industry generates up to 100 million barrels of brine per day, MGX said. Now that the technology has been proven in the lab and in the test field, the first commercial portable unit will be deployed at a site in northern Alberta later this year. Meanwhile, on June 5, 2018, MGX said it intends to complete a non-brokered private placement aimed at raising $7 million on a non flow-through basis, as well as a concurrent non-brokered flow through private placement that aims to raise a further $5 million. Total proceeds are expected to be $12 million. It said the non flow-through financing will consist of an offering of 6.37 million units priced at $1.10 per unit. The flow-through financing consists of an offering of 4.35 million units priced at $1.15 each. Proceeds will be used for qualified mineral expenses at the company’s Canadian projects and for the advancements of the MGX’s lithium and magnesium assets, including continued investment into extraction equipment and PurLucid. MGX currently holds a 51% stake in PurLucid, but has the right to increase its stake to 100%.